After morning tea we will transfer to the railway station to board the flight for Haridwar. Breakfast on board. Upon arrival at Haridwar railway station, our representative will be waiting for your welcome. Further he will transfer you to the hotel. After fresh-n-up we will explore the temples of Haridwar visiting Mansa Devi temple and Chandi Devi temple. Later in the evening we will visit to Har (Lord Shiva) Ki Pauri to witness the glimpses of Ganga aarti. 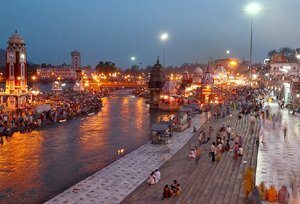 Each evening at Har Ki Pauri thousands of people gathers on the both sides of the river bank for aarti followed by ringing bells and holy chants. Here you will be enlightened by the floating Diyas (lights) and flowers as it creates a spectacular view during the Ganga aarti. Today we will leave for Rishikesh, the Yoga Capital of The World. 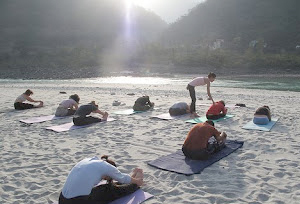 Upon arrival at Rishikesh we will transfer to the yoga Ashrama. After fresh-n-up we will witness the discourse on Yoga and meditation brief by a Yoga teacher. Wake up early in the morning. After fresh-n-up the morning Yoga and meditation season will start at the Ashram. Further have liquid food in breakfast followed by medicated oil massage and steam bath. After lunch its free time at the Ashrama or one can have individual questions hours with the Yoga guru. Early in the evening indulge with second Yoga and meditation season of the day. Later in the evening we will visit the ganga bank for Ganga aarti. Later return to the Ashram for dinner (as prescribed by the doctor) and overnight stay. We will be continuing our yoga and meditation seasons for three consecutive days. Overnight in Ashrama. Today after breakfast we will check out from the Ashrama and will go on city sightseeing tour Rishikesh visiting various temple and sightseeing places like Laxman Jhula, Ram Jhula and Shri Bharat Mandir, it is the oldest temple of Rishikesh and mentioned that in 789 A.D Jagadguru Adi Shankaracharya reinstalled the presiding deity in the temple. Later drive to Haridwar. Upon reaching transfer to the railway station to board the train for Delhi. Upon arrival at Delhi meet with our representative and transfer to the hotel. Overnight stay at hotel. 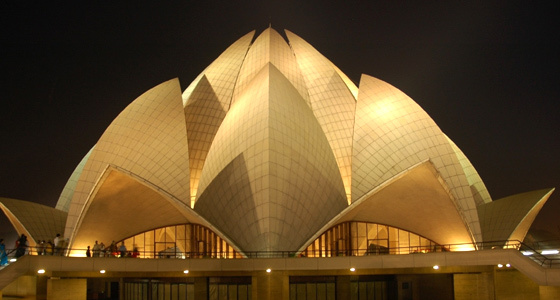 Today we will have a half day city sightseeing tour of Delhi, starting with a visit to the Lotus temple, styled as a lotus flower with 27 immaculate whiter-marble petals, it is the perfect place to meditate and enjoy the silence being in the bustling city of Delhi. Further we will visit to the Akshardham temple complex, having record of the world’s largest comprehensive Hindu Temple. Here once can visit the exhibitions center which features the incidents from the life of Swaminarayan in his teenage and the early history of India.